At the same time, Wendigos were embodiments of gluttony, greed, and excess; never satisfied after killing and consuming one person, they were constantly searching for new victims. 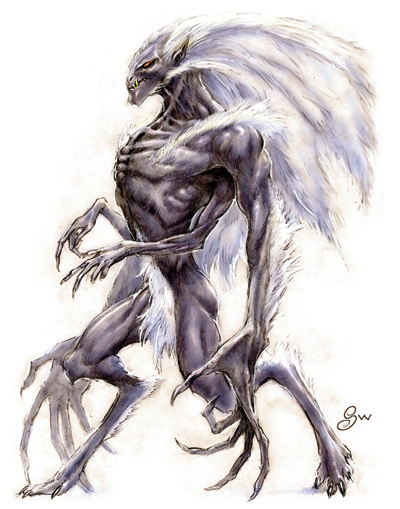 In some traditions, humans who became overpowered by greed could turn into Wendigos; the Wendigo myth thus served as a method of encouraging cooperation and moderation. Among the Ojibwa, Eastern Cree, Westmain Swampy Cree, and Innu/Naskapi/Montagnais, Wendigos were said to be giants, many times larger than human beings (a characteristic absent from the Wendigo myth in the other Algonquian cultures). Whenever a Wendigo ate another person, it would grow larger, in proportion to the meal it had just eaten, so that it could never be full. Wendigos were therefore simultaneously constantly gorging themselves and emaciated from starvation.